1. June 25: Laguna Niguel (Also, July 9 and July 23.) Music by Mike Wilson and Michael Physick. Shows 2 p.m. to 4 p.m. Free merchant samples and coupons while supplies last. Location: Laguna Niguel Promenade, 27891 La Paz Road. 3. June 28: Buena Park Uptown Funk (Bruno Mars tribute). Boisseranc Park. 7 p.m. to 9 p.m. 7520 Dale St.
4. June 29: Fullerton Big Bad Voodoo Daddy. 6 p.m. to 8 p.m. Free parking. Craig Regional Park, 3300 State College Blvd. 714-973-3180. 5. June 29: La Habra Suave (Latin, oldies) performs. 7 p.m. at El Centro-Lions Park, 320 E. Erna Ave. 562-383-4200. 7. July 1: San Juan Capistrano Guitarist Mike Chamberlin will sing the songs of World War II, including romantic love songs, at the San Juan Capistrano Historical Society. Two songs, at 4 p.m. and 6 p.m. 31831 Los Rios Street, San Juan Capistrano. 10. July 6: Fountain Valley The 80z Allstars rock and funk. Starts at 6 p.m. Fountain Valley Live! Recreation Center & Sports Park. 16400 Brookhurst St.
11. July 6: San Clemente Kelly Boys Country Music. 6 p.m. at Linda Lane Park. 400 Linda Lane. San Clemente. Learn how to line dance, too. Food truck available. 12. July 7-8: Mission Viejo Shrek In Concert. Saddleback College. 7:30 p.m. Upper Campus Quad. 28000 Marguerite Pkwy, Mission Viejo. Free parking. Reserved seating and dinner from food trucks available for purchase. 14. July 8. La Palma Smokin Cobras (classic rock and jazz). Concerts at Central Park. 6:30-8:00 p.m. cityoflapalma.org. 17. July 13: Fountain Valley Stone Soul (classic soul and Motown). Starts at 6 p.m. Fountain Valley Live! Recreation Center & Sports Park. 16400 Brookhurst St.
18. July 13: La Habra The Answer (Rock, oldies) 7 p.m. at La Habra Marketplace, 1801 W. Imperial Hwy. Learn more at Community Center at 562-383-4200. 19. July 14: Mission Viejo Shep Shepherd (big band). Saddleback College. 7:30 p.m. Upper Campus Quad. 28000 Marguerite Pkwy. Free parking. Reserved seating and food truck food available for purchase. 20. July 15. La Palma Stone Soul (classic soul and Motown). Concerts at Central Park. 7821 Walker St. 6:30-8 p.m. cityoflapalma.org. 23. July 19: Irvine Pacific Symphony in the Cities concert at Mike Ward Community Park. Musical playground 5:30 p.m. Concert 7 p.m. 20 Lake Rd. 949-724-6606. 26. July 20: Fountain Valley Queen Nation (Queen tribute). Starts at 6 p.m. Fountain Valley Live! Recreation Center & Sports Park. 16400 Brookhurst St.
27. July 20: La Habra DSB: Journey Tribute Band 7 p.m. at La Habra Marketplace, 1801 W. Imperial Hwy. 562-383-4200. 28. July 21-22: Mission Viejo Saddleback College. 7:30 p.m. Upper Campus Quad. Fully staged musical The Music Man. 28000 Marguerite Pkwy. Free parking. Reserved seating and food trucks available for purchase. 29. July 22. La Palma The Silverados classic country rock. Concerts at Central Park, 6:30-8 p.m. 7821 Walker St. cityoflapalma.org. 32. July 27: Fountain Valley Desperado (Eagles tribute) plus a 5 p.m. business expo. Concert starts at 6 p.m. Fountain Valley Live! Recreation Center & Sports Park. 16400 Brookhurst St.
34. July 29: La Palma . Amanda Castro Band. 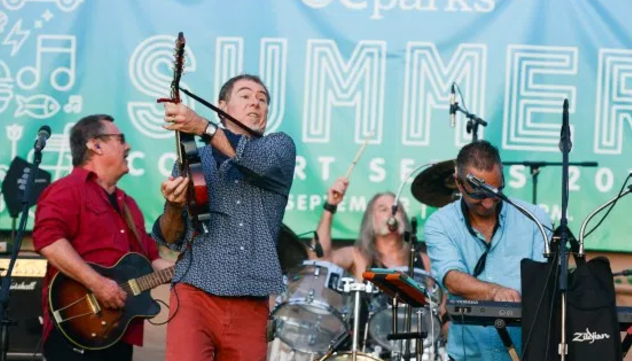 Concerts at Central Park, 6:30-8 p.m. 7821 Walker St. from cityoflapalma.org. 37. Aug. 5: La Palma Mirage (Fleetwood Mac tribute). Concerts at Central Park, 6:30 p.m.-8 p.m. 7821 Walker St. cityoflapalma.org. 40. Aug. 6: Santa Ana Outdoor concert featuring James Intveld at the Fairhaven Memorial Park. 4 p.m. to 7 p.m. after the classic car show. 1702 Fairhaven Ave. 714-633-1442.